The DISCO floor polisher head is lightweight, easy to operate, and very low cost compared to alternative polishing machines. It features a new floor-pad technology that provides a high-gloss shine to many types of hard floors without the use of water, chemicals or polishing sands. And its drive disc has instantaneous height adjustment, along with automatic shut off caused by disc obstructions or suction blockages. fine dust created during the polishing process. The DISCO is truly a revolution in hard-floor care! The SEBO DISCO Floor Polisher – introduces a new sophisticated and highly efficient floor-pad technology that produces a high-gloss effect without the use of water, chemicals or polishing sands. The new pad technology achieves its results by using four different floor pads, each of which is designed to accomplish distinctly different tasks. The pads are color-coded to assure proper selection. In addition, they are highly abrasion resistant and have a life expectancy of over 100,000 square feet. PVC (coated or uncoated vinyl or vinyl composite tiles). Natural stone, such as granite, marble or terrazzo. Hardwood with oil or varnish finishes. Hardwood or other floors with soft-coated finishes, like wax (use the blue floor pad only). Step One. The Red Floor Pad – removes the deepest or most visible scratches and smoothes the floor surface. Thus, it prepares the floor for the yellow pad. Step Two. The Yellow Floor Pad – restores a higher gloss finish and prepares the floor surface for the green pad. Step Three. The Green Floor Pad – creates the final gloss finish in the “three-step process,” and it is suitable for daily use to maintain the floor’s high-gloss finish. The Blue Floor Pad – is designed to maintain soft coatings, like wax, on hard floors, and it is suitable for daily use as well. Any floor on which a shiny finish is not desired. Glazed, ceramic and porcelain tiles, or porous tiles such as terracotta or slate. Cushioned vinyl, linoleum, laminate, and any floor types that are poorly bonded to the sub-floor . All floors with textured or uneven surfaces or tiles with raised edges. polisher use is contrary to manufacturer recommendations. The DISCO Polisher is the solution to all of these problems, and it is built to commercial-quality standards! Small and medium-size furnished hard-floor areas do not easily accommodate typical polishers. Big, heavy, hard-floor polishing machines are difficult to use, require trained staff and are expensive. Regular maintenance of hard floors is costly and time consuming. 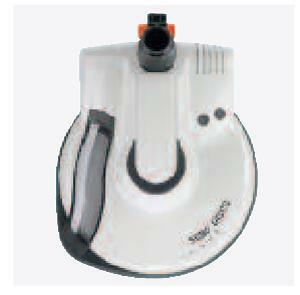 Typical hard-floor polishers have limited flexibility and mobility. Most hard-floor polishers cannot reach small areas. Correct use of floor-care chemicals and polishing sands is difficult and requires sophisticated knowledge.